How Baltimore’s state’s attorney became the prosecutor who quieted a troubled city. Another death of a young black man in the hands of police, this time, in Baltimore. But this time, things would be different. 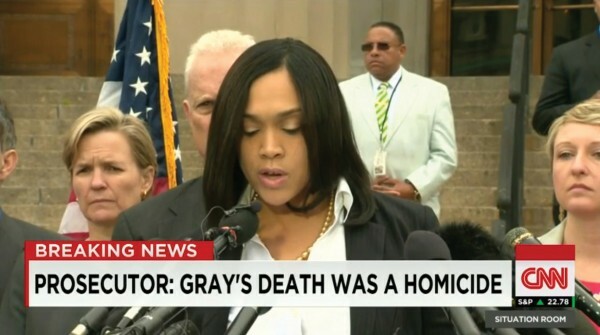 This time, State’s Attorney Marilyn J. Mosby ’05 spoke these words on national television: “We have brought the following charges…” And she called for the arrest of six police officers for crimes ranging from misconduct in office to second-degree depraved-heart murder. With that, Mosby rose to national prominence, and quelled the fires of a city that had been burning since the death of Freddie Gray. Gray, a twenty-five year-old African American man, “made eye contact” with police on the morning of April 12, 2015, in a West Baltimore neighborhood, and started running. The police pursued and arrested him. Within the hour, Gray was rushed to a hospital emergency room. Two days later, he underwent spinal surgery. He died on April 19. According to his family, his spine had been 80 percent severed. Baltimore erupted in more than two weeks of violent protests, which ended April 30 with Mosby’s announcement. Mosby’s decision to charge the six police officers involved in Gray’s arrest was widely credited with calming the community, but there is no getting away from the tragedy of the situation. 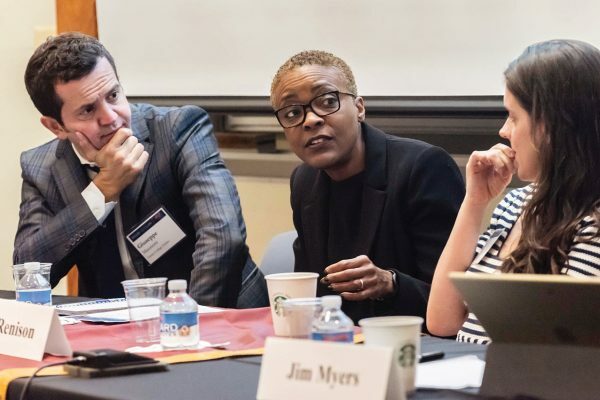 “This is not the kind of case that any prosecutor wants to see come across her desk,” said Tracey West, BC Law’s associate dean for external relations, diversity, and inclusion. She was a faculty advisor to Mosby when Mosby was a student. Mosby, all of thirty-five and on the job only since January, has been widely lauded and also criticized for taking swift action in the case of Freddie Gray. Yet she appears calm in the center of the storm. “At the end of the day, this is where the facts have led me and I know that my pursuit is justice,” she said in a recent phone interview. “The foundation of everything that I learned was at BC, especially about being a prosecutor,” she continued. “In making the decision and ultimately understanding that the duties and obligations of a prosecutor is to seek justice over convictions—that was instilled in me in my prosecutorial ethics course [taught by Professor Michael Cassidy]. That’s the foundation of who I am and what I believe, and it started at BC,” she said. In fact, Mosby’s choices during law school suggest that she was intentionally preparing herself for a career in criminal justice. She worked for the US attorney’s office in Boston and DC, and for Boston’s Suffolk County homicide unit. Besides prosecutorial ethics, she took courses in Criminal Law, Constitutional Law I and II, a seminar in theories of punishment, a seminar called Authority and Leadership in Professional Life, and she served in the Civil Litigation Clinic and in the year-long BC Defenders clinic. She wrote a research paper looking closely at two cases that affected her personally: the murder outside her home in Dorchester, when she was just fourteen, of her seventeen-year-old cousin by another seventeen-year-old, and the conviction of another young cousin for attempted murder. As Mosby’s supervisor in the BC Defenders clinic, Clinical Professor Sharon Beckman got a glimpse of Mosby’s developing philosophy of criminal justice. Mosby represented a woman who had violated the terms of her probation. When Mosby realized that her client had a substance abuse problem, she started pushing the probation officer for time in a treatment program instead of prison. The probation officer kept refusing, but Mosby kept advocating, and he eventually relented. Her client went into a residential treatment program, got clean, and then stayed on as a counselor to other women seeking treatment. When Mosby’s law school graduation drew near, the probation officer contacted Beckman. “He wanted to know if he could write a letter of recommendation for Marilyn,” Beckman said. Clinical Professor Evangeline Sarda, who had Mosby in her seminar on authority and leadership, said that Mosby’s rich biography provides advantages as she tackles the role of Baltimore’s lead prosecutor. In high school, Mosby was in METCO, the oldest desegregation program in the country, and at one point was the only black child in her school. She graduated with honors, attended Tuskegee University in Alabama, the first in her family to go to college, and received a presidential scholarship. She comes from five generations of police officers. “The complexity of her experience, what she represents, the fact that she wants to be a voice for any victim and, at the same time, her affiliations with the police department—I think that managing all these inner tensions is a strength of hers,” Sarda said. What Mosby learned since leaving BC Law is that Baltimore and communities across the country are extremely distrustful of law enforcement and the criminal justice system. 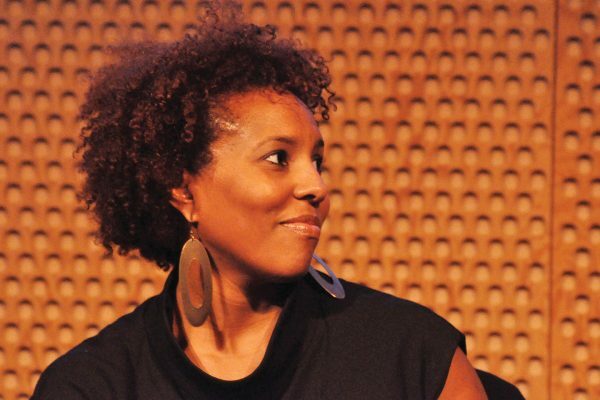 “You have to think of ways to address that so you can ultimately get your job done,” she said. To that end, in her short time as state’s attorney, she has instituted a number of community programs intended to break down what she calls “the barriers of distrust.” A cornerstone of that effort is the appointment of community liaisons for every section of the city. From the age of fourteen, after her cousin’s murder, Mosby said she has wanted to keep young people from choosing a life of crime. It’s a journey she continues as state’s attorney for the troubled—and hopeful—city of Baltimore. 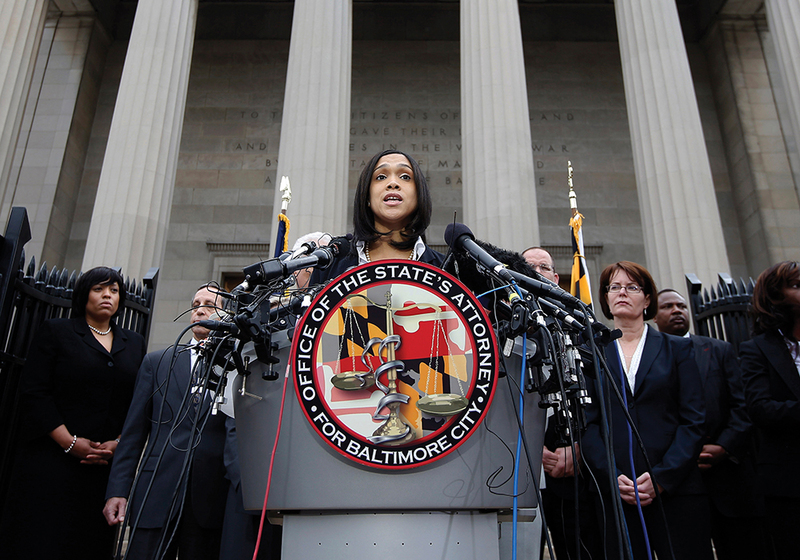 Above: Marilyn Mosby, Baltimore state’s attorney, announced criminal charges against six police officers on May 1.